I remember the days when brunch was a lazy, hungover affair that took place any time after 2pm on a Sunday, and was usually accompanied by a “hair of the dog.” These days, it’s more likely to take place at what I would term “breakfast time”, and be accompanied by the bottles of milk and buggies of those friends who have since grown up and acquired small, giggly, wriggly responsibilities. And I wouldn’t change a thing. I also had admit to myself recently, that I’d become just a bit set in my brunch ways and needed to try some new places. 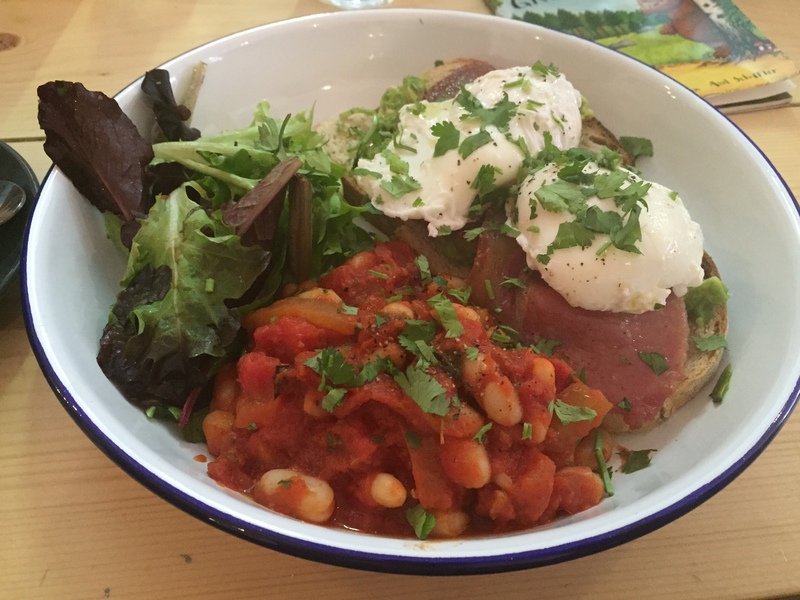 So, given that “brunch in Dublin” is still one of the most popular search terms leading visitors to this blog, this review brings you two new (or new to me) options for brunch in Dublin that are well worth your patronage of a weekend morning. Unintentionally, they both begin with B! The counter at Blas Cafe. 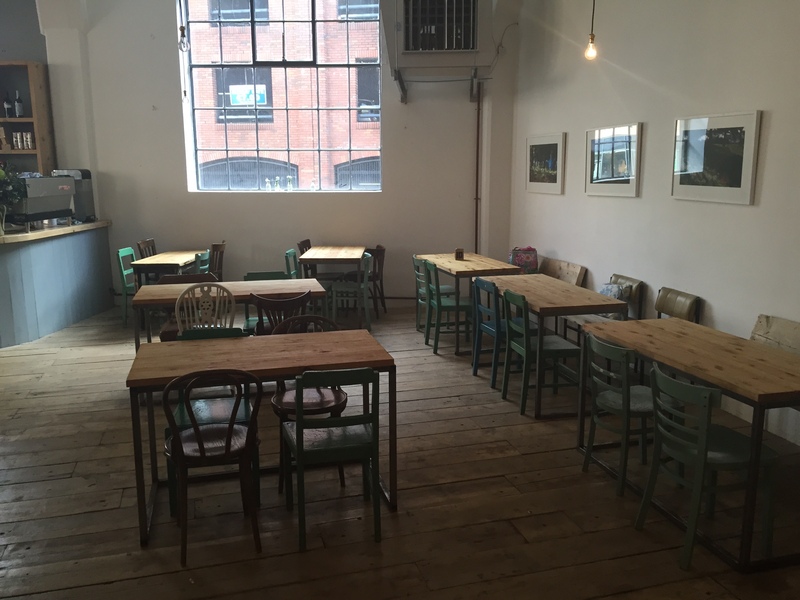 First up, the very family-friendly Blas Cafe, located in the Chocolate Factory building on King’s Inns Street in Dublin 1. If you’re a southside-dweller like me, fear not, this is well worth the trip. Just head for the Cineworld cinema, and you can even park in their car park. The cafe is just down this side street between Bolton Street and Parnell Street – there was also plenty of on-street disc parking available on the day I visited. 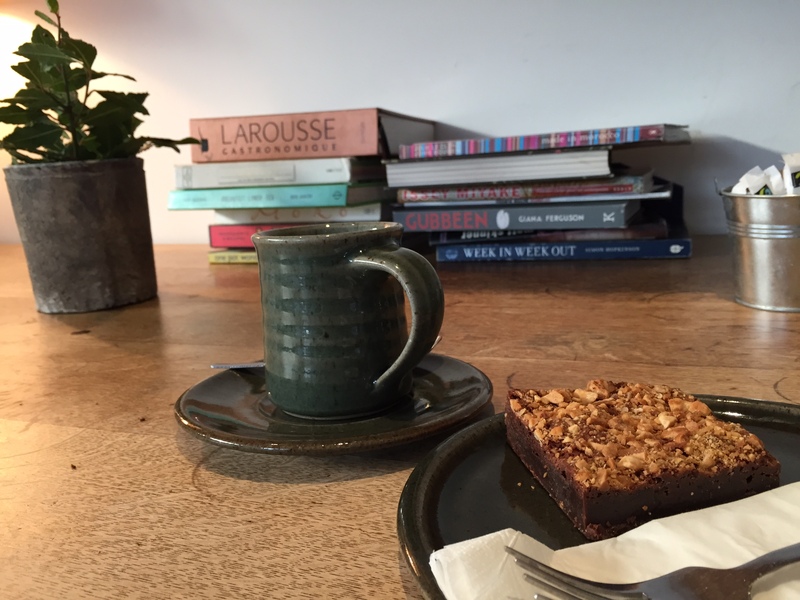 The Chocolate Factory is a creative working space, home to artists and creative businesses, that feels like still very much a work in progress, and Blas occupies the ground floor. And what a ground floor. I could see why the friends who selected our brunch venue that day have become regulars here. A huge, airy space filled with large and small wooden tables that offers plenty of space for little feet to run around, and lots of interesting nooks and crannies for them to poke into (or to park a buggy in). There’s even a drum kit art installation – but maybe best to keep them away from that one. 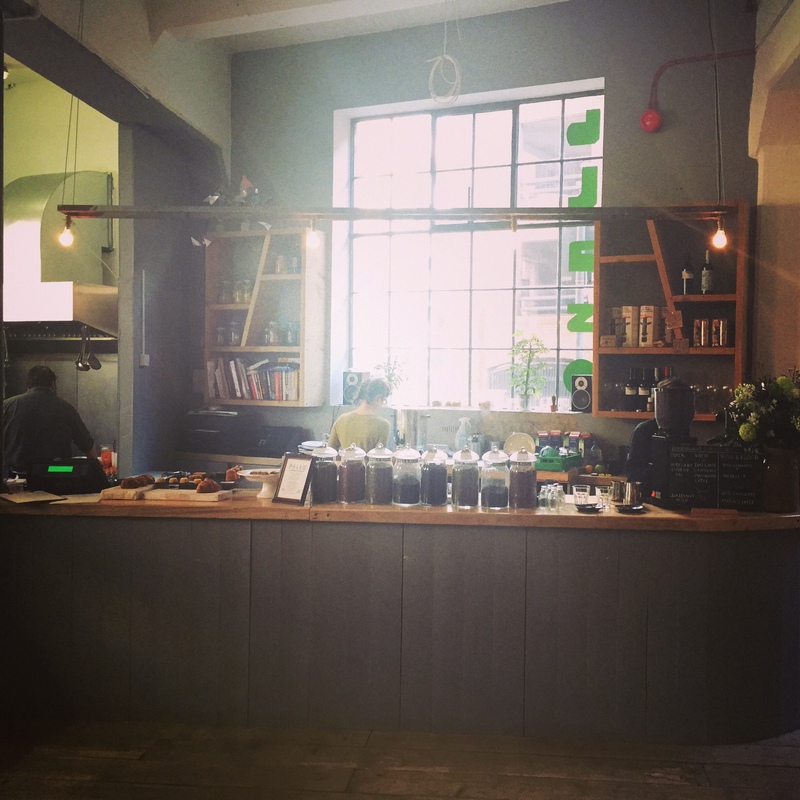 On a Saturday morning, sunshine was streaming in through the windows and throwing light on the lovely counter displaying cakes and Wall & Keogh teas, and onto the huge kitchen area. I’d describe Blas as the Fumbally of the Northside, without the queues. We had a big bench to gather our assorted group of adults and small people around, and it lent itself well to people arriving and ordering at different times. You order at the counter and your food & drinks are brought to the table a short while later. Fresh from a Pilates class at my “happy place,” Form School that morning, I was determined to keep it healthy, and thankfully there were plenty of options for me to do so. From the simple menu (a little annoyingly, not published anywhere online so I can’t share it with you) I chose the poached eggs with bacon. This came with a delicious portion of homemade baked beans in tomato sauce, two pieces of lean bacon, a plentiful serving of avocado and salad leaves and some sourdough toast. I passed on the toast, but thankfully there were a few hungry little mouths only too delighted to take it off my hands. A hearty brunch or breakfast dish, and fantastic value at just €7.95. Poached eggs & bacon at Blas, with optional side of Gruffalo. The coffee was great, so I had two, and with the second I decided to indulge in a “Paleo” coconut brownie (just like the cavemen used to eat, obviously). But that was unfortunately a little bland, and not worth the calories it inevitably contained. That’ll teach me. The cafe was pretty empty while we had our brunch, but was starting to fill up around 12.30 or so as we got ready to leave. It currently opens for brunch on Saturdays only, so don’t leave it until Sunday, or you’ll be disappointed. The second great brunch experience I had recently was a little more akin to those lazy brunches of old, when my friend the Divine Doctor (she’s going to love that nickname) and I, took a trip across the city centre for a late Sunday afternoon visit to Bibi’s on Emorville Avenue. Just off the South Circular road on a red-brick residential street, Bibi’s has long been a haunt of the Dublin 8 cool crowd, but it had been ages since I’d paid it a visit. What was formerly half clothes shop, half cafe, has been fully transformed into a cafe/restaurant which is now one of the prettiest spaces I’ve eaten in in Dublin. If you, like me, are a little jaded by the usual french toast and Eggs Benny options of Dublin’s many brunch spots, the weekend menu at Bibi’s is an altogether different kettle of fish. An Ottolenghi-esque roster of ingredients turns out original brunch dishes like Turkish Eggs; Roasted butternut squash & poached eggs; as well as twists on the standard brunch options such as a smoked salmon Eggs Florentine and a sinful-sounding roast ham, Gubbeen cheese and relish pan-fried toastie. We both settled on the roasted squash with poached eggs, out of pure curiosity. 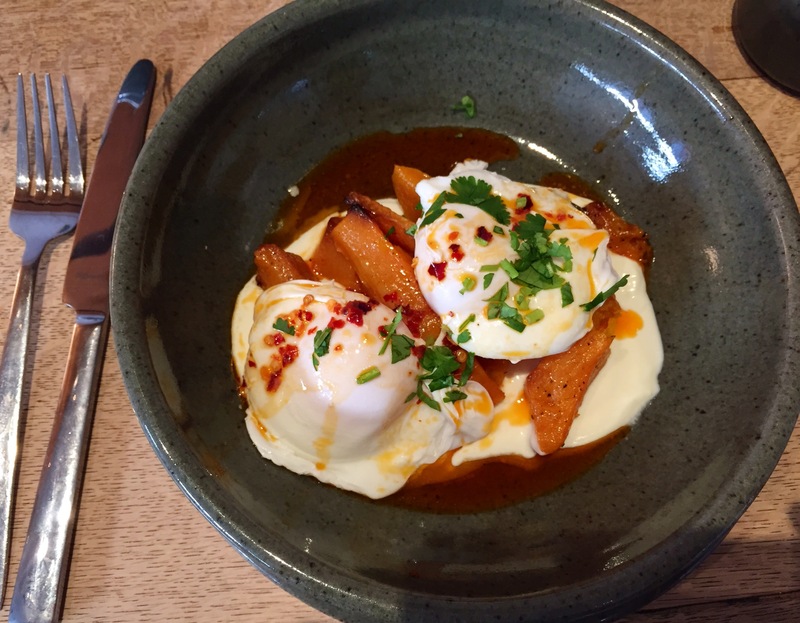 Butternut Squash and Poached eggs… I dream of this. Whoever invented this dish is nothing short of a genius. Covered in garlic yoghurt – YES you read this right, and it is amazing – and drizzled with chilli butter, this was a dish I wanted to order again before I was even halfway through it. A generous bowl of toasted, fresh sourdough and two tiny dishes of butter was served alongside our egg dishes. I loved the toast being served on the side, rather than the ingredients all being piled on top of the toast as you get in so many restaurants. Having walked to the Poolbeg lighthouse earlier that afternoon, we’d already decided we had earned a treat, and picked the Hazelnut Blondies from the pile of baked treats that had greeted us on walking in the door. These were washed down beautifully by Cloud Picker coffee (I’ve been enjoying a bag from this new Irish micro-roaster at home the last few weeks), and fresh green juices by Sprout. Add to that the veritable flock of the loveliest, friendliest waitresses who attended to our every wish and didn’t rush us when we were sitting there after the other customers had left, and it all added up to make it a most relaxing Sunday afternoon. So I’ll be adding both Blas and Bibi’s to my weekend haunts from now on, and maybe I should move onto the C’s next. Any suggestions? Blas Cafe, The Chocolate Factory, King’s Inns Street, Dublin 1. Check out their Facebook page.